Hello, I would like to ask for information on ginseng extraction. Instead of a spirulina, I already have a heating nest. Frita is practically filled with dirks. Like alcohol, I used 60% pharmacy and I now use 40% old-fashioned (with aniseed silica). I leave the extractor out of the rule for 4-5h. I use 30g of Siberian ginseng and 250ml of 40% alcohol. How much do I actually have a concentrated tincture? It does not seem to me how to compare it and how it is comparable to what is being bought on the market. The tint curve has a relatively dense yellow color after extraction. Will some substances break down due to long-term heating, or at what time? I tried to reuse the finished tincture again to extract another 30g (I knew the solvent is being recycled) of ginseng. The resulting product was already brown in color, and a relatively heavy sedimentation stuck to the walls of the flask. The known person subjectively described such a tincture as a feeling of minor effect. Finally, I would like to write that I do not enjoy full-fledged high school knowledge of chemistry, it's just my hobby since my childhood. But there is no problem learning something. At twenty-six years, it's easy to get into my head. I do not know anyone with the necessary knowledge about the ginseng-owning extractor. I have a weakness for the laboratory glass, and your extractor looks directly in the textbook ... 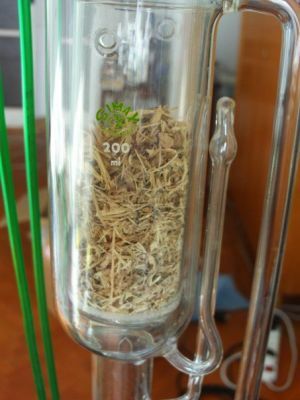 When I wrote about the extraction of ginseng drugs on Soxhlet's extractor , I did not expect to find so many real professionals interested in professional methods. Your material is otherwise suspiciously similar to that just asked by a regular reader who bought it from Salvia Paradise. Please do not call him a ginseng, but an eleuterokok, otherwise it will knit with a real ginseng. When I use the term ginseng in the following text , I always think Panax , the so-called " Siberian Ginseng " I mean as eleuterokoccus ( Eleutherococcus senticosus ) . You make it right that you fill it in the extraction vessel to the edge, because rather than a tree, a herb , it is wood, lignum (perhaps) eleutherococci senticosi , which swells only a fraction of its volume. Yellow carotenoids may appear yellow. Tincture do not compare anything, just mark out how many grams of drug comes from 100ml tinctures and you have it. If your drug is ok, then you can trust your own tinktura more than the products on the market. Chemically relatively simple Eleutherococcus I studied less in detail than ginseng. I feel, however, that they can withstand the extraction of their active substance for four to five hours without serious damage. I would like to allow the eleutrook to heat up to 100 ° C for up to 2 hours and at your 90 ° C evenly 4. The temperature can be further reduced by increasing the alcohol content or by extracting under reduced pressure. I know that in ginseng (right) heat from panaxosides is removed by malonyls, but otherwise the etheric bonds hold both the Jewish faith. Even if they hydrolyze, it is not a disaster, those hydrolyzed forms are also effective. The hydrolytic cleavage of saponin sugar residues also occurs after digestion in the digestive tract, where the milky bacteria often irradiate up to the aglycone. For ginseng (right) there are two main aglycans panaxoside PPT and compound K, and these are also highly effective, for example, against the hangover . (Eleutherocok, unfortunately, I do not have such a bad look.) What you stick to the walls would seem to be a phytochemical nomenclature , without any longer delay, included among the "substances of bitter nature" :-), but what exactly can be, I do not know. I do not think this is the result of longer warming, rather than exceeding the solubility limit of something in that mixture of alcohol and water, which then returns to the glass. Residual sediment is not welcome because it can pull some of the active substances. Try if it does not dissolve in a higher alcohol concentration. It's not a 100% chance, for example, Canadian balsam must be xylene for the permanent preparation of the protozoa, but it can happen. Perhaps you will have to increase the concentration of alcohol again. As far as the subjective evaluation of the effect of eleutherococcus is concerned, it is hardly in my view, but I do not want to say that it is impossible. I would say that the syrups you've come across are syrupy rather because of the addition of viscosity-increasing substances (alginates, gelatin or other tricks) rather than because of their high concentration. However, the hydrophilic viscous carrier may also have a positive effect by entrapping the molecules of the contents in the solution (rather than sticking to the glass). Just so I do not talk too negatively about something I do not know. In summary, it would seem from your experience that the concentration of alcohol and the reasonable strength of the tincture is limited in the case of woody eleuterokok with the presence of resins that are not a problem for ginseng. 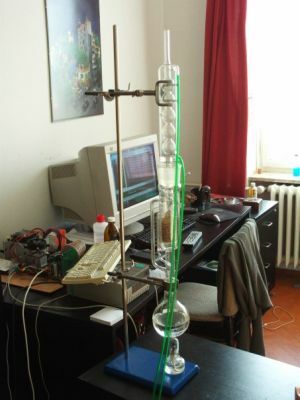 As far as the study of chemistry is concerned, do not worry about it at all. Rather, think about experimenting not only with a lot of fun, but also something positive that brings you something, which is a problem harder than chemical-engineering calculations. If you are interested in practical chemistry, you can study the theory later. Then you will understand that you are not studying for a piece of paper, but in order to better understand what you already know from practice.